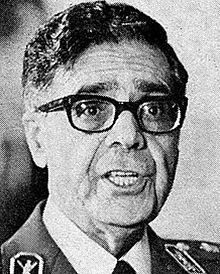 Arteshbod Gholam Reza Azhari (Persian: غلامرضا ازهاری‎; 18 February 1912 – 5 November 2001) was a military leader and Prime Minister of Iran. Azhari was born in Shiraz in 1912 (or in 1917). He was a graduate of Iran's war college. He was also trained at the National War College in Washington in the 1950s. Azhari worked at the CENTO. He was appointed chief of staff of Iran's armed forces in 1971 and his tenure lasted until 1978. He served as interim prime minister of a military government until a civilian government could be chosen. He served as prime minister from 6 November 1978 to 31 December 1978. He formed the first military government in Iran since 1953. On 21 December 1978, Azhari, then the prime minister, told U.S. Ambassador to Iran William Sullivan that, "You must know this and you must tell it to your government. This country is lost because the Shah cannot make up his mind." Azhari had a heart attack in January 1979 and resigned on 2 January. Then he was succeeded by Abbas Gharabaghi as the chief of the army staff. Shapour Bakhtiar succeeded Azhari as prime minister. On 18 February 1979 Azhari was retired from the army in absentia. However, it is also reported that the government was of eleven men and six of them were military officers. Azhari suffered a heart attack while serving as prime minister. After leaving office he went to the US in January 1979 for heart surgery at Bethesda Naval Hospital. After surgery he did not return to Iran and settled in McLean, Virginia. In the immediate aftermath of the revolution, Ayatollah Sadegh Khalkhali, a religious judge and then chairman of the Revolutionary Court, informed the press that the death sentence was passed on the members of the Pahlavi family and former Shah officials, including Azhari. He died of cancer in McLean, Virginia, USA, on 5 November 2001. ^ a b c "Index At-Az". Rulers. Retrieved 31 July 2013. ^ Rubin, Barry (1980). Paved with Good Intentions (PDF). New York: Penguin Books. p. 220. ^ a b Raein, Parviz (6 November 1978). "Shah decrees military control in Iran". The Day. Tehran. AP. Retrieved 4 November 2012. ^ Mansoor Moaddel (January 1994). Class, Politics, and Ideology in the Iranian Revolution. Columbia University Press. p. 160. ISBN 978-0-231-51607-5. Retrieved 25 July 2013. ^ Sullivan, William H. Mission to Iran. New York: W.W. Norton and Company, 1981. p. 212. ^ a b c d e "Gholamreza Azhari, 83; Briefly Served as Iran's Prime Minister". Los Angeles Times. 18 November 2001. Retrieved 31 July 2013. ^ "Iran Cabinet". The Telegraph. 2 January 1979. Retrieved 31 July 2013. ^ a b "Shah selects chief of staff". The Palm Beach Post. Tehran. 5 January 1979. Retrieved 4 November 2012. ^ "General Gholam Reza Azhari meets the Foreign Press (1978)". Iranian. Retrieved 31 July 2013. ^ Jahangir Amuzegar (1991). The Dynamics of the Iranian Revolution: The Pahlavis' Triumph and Tragedy. SUNY Press. p. 255. ISBN 978-0-7914-9483-7. Retrieved 1 August 2013. ^ "No Safe Haven: Iran's Global Assassination Campaign". Iran Human Rights. 2008. Retrieved 4 August 2013. This page is based on the Wikipedia article Gholam Reza Azhari; it is used under the Creative Commons Attribution-ShareAlike 3.0 Unported License (CC-BY-SA). You may redistribute it, verbatim or modified, providing that you comply with the terms of the CC-BY-SA.